Managerless Lancing put six past rivals Shoreham as they got off to a winning start following the departure of boss Ash Bailey. Charlie Pitcher struck four times in a match for the second time this season, with John Lansdale chipping in with a double as Lancers eased to a 6-0 Sussex RUR Cup second round triumph over Mussels at Middle Road last night. First team coach Mark Pulling took charge of the cup clash after manager Bailey resigned just a handful of games in to his second spell at the club but Lancing had no trouble seeing off Shoreham. Lansdale and Pitcher both struck twice in a fine first half showing as Lancers led 4-0 at the break. 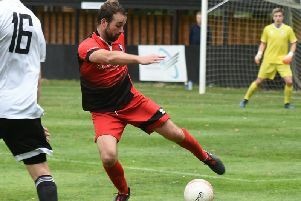 Pitcher completed his hat-trick on the hour but there was still time for him to get a fourth and Lancing’s sixth five minutes later to wrap up a 6-0 triumph to seal a spot in round three. Lancing chairman Steve Taylor admitted his sadness at seeing Ash Bailey resign from his role as Lancing manager last week, but respects his decision to step down. Bailey was just a handful of games in to his second spell in charge of the Culver Road outfit before calling time owing to work and family reasons last Thursday. Chairman Taylor completely understood the reasoning behind Bailey stepping away from his management position and thought it was a shame that their working relationship had ended prematurely. He said: “It’s always sad to see a manager go. We all give up a lot of time in football and he has a young family, has a business and unfortunately a family member isn’t very well at the moment so I totally understand and respect that fact. We always try to have a good relationship with a manager and you do hope for something long term, but things change in football. In a club statement, departing boss Bailey said: “People do not realise how much personal time running a county league football team takes up. “The additional pressures of an FA Cup run put me in the position of having to choose between family or football and that is not fair to my family, Lancing FC or players. “Now that the run has finished I still have the situation of family or football as it is such a time consuming role. I won’t be looking to get involved in any capacity elsewhere and for the foreseeable future, I am having a break from football. “I will be a spectator where possible, but for the moment my family is my most important focus. I have always given my all to Lancing FC but the pressure in this second stint means I cannot give 100 per cent to this amazing club." Taylor is looking to act quickly as the club seek to find Bailey’s successor.